Daily Illuminator: Memorial Day Convention Madness! May 29, 2017: Memorial Day Convention Madness! While you are enjoying an extended weekend, the SJ Games team is all over the place, attending three different conventions! I mean, we're playing games, but sometimes, that's hard work! Rhea and Randy hit up the midwest with ACD Games Day in Madison, WI. 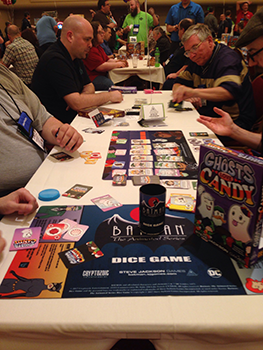 They gave retailers and distributors their first look at some of our upcoming games, and featured a lot of our new releases, like Ghosts Love Candy and Batman: The Animated Series Dice Game. Plus, it's in Madison, the home of John Kovalic, so of course he made an appearance! The Texas contingent stayed closer to home at BGG.Spring, an extension of fall's BGG.con. It's a very fun convention with a cozy atmosphere, and a metric ton of games to play. The BoardGameGeek game library is meticulously curated, and having access to it for four straight days is an absolute treat. We had a chance to preview the upcoming Port Royal, full of ships, gold, and pushing your luck! If you can manage it, I highly recommend BGG.Spring next year. Having rooms available 24 hours a day, plus a ton of games to check out, is a combination for an amazing holiday weekend. Guy and I had the pleasure of attending our first PaizoCon in Seattle, WA. Paizo makes Pathfinder RPG, and are long-time friends of ours. When they asked us to come out and teach Munchkin Pathfinder, it was a no-brainer! Our delightful Seattle MIBs helped us host an entire room of SJ Games, including a jumbo-sized version of Munchkin Pathfinder that Guy created. 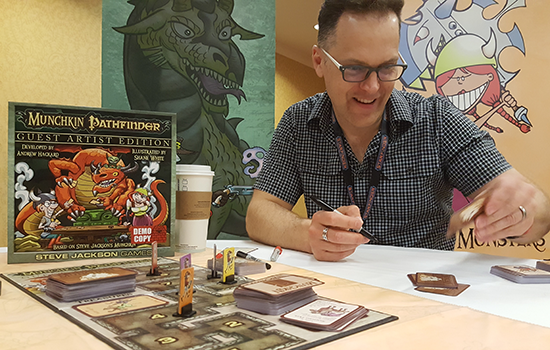 We even had a signing by Shane White, illustrator of Munchkin Pathfinder Guest Artist Edition, Truly Gobnoxious, and the upcoming Pathfinder 2. 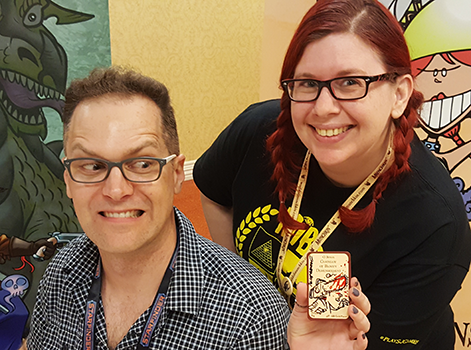 Not only did he sign some Cannon Fodder and Unholy Cow promos, he also drew unique Munchkin Sketch Edition cards for each signee! 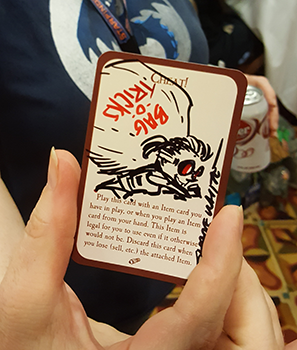 Many grateful fans walked away with a one-of-a-kind card to add to their Munchkin set. Thanks so much, Shane! I don't recall another weekend this packed with events, but who needs rest anyway? There are games to be played! Hopefully you had a great holiday, full of friends and games. And if you attended any of these shows, thanks for stopping by!